Produced by Joey Butler. Video by Kathleen Barry. "When I was a child, I was either going to be a missionary in Africa, in a rock band or on Broadway...the rock band won out." The Rev. Sherry Cothran Woolsey's journey has taken the Nashville pastor from the concert stage to the pulpit ... with occasional trips back to the stage. Rock musicians on tour are a notoriously rowdy bunch. KISS guitarist Ace Frehley once superglued every piece of furniture in his hotel room to the ceiling. Ozzy Osbourne was arrested for relieving himself on The Alamo. The Evinrudes’ lead singer Sherry Cothran, on the other hand, used to read an anthology of Thomas Merton’s essays on the tour bus. Perhaps this is why The Evinrudes were never featured on VH1’s Behind the Music. She may be a little light in the “tossing TVs off the hotel balcony” column, but Cothran boasts some bonafide rock ‘n roll street cred: a hit song, tours opening for the likes of Spin Doctors and the Goo Goo Dolls, a photo in Rolling Stone magazine. After years of paying dues and traveling nonstop, the culmination of those rock-star dreams found Cothran and her fellow Evinrudes signing a contract with Mercury Records. But, on those far-too-frequent occasions when art and commerce merge, art never wins out. The record label was acquired by a drink-manufacturing company. (Read that sentence again and ponder.) Nine months after signing their major-label deal, The Evinrudes and 250 of their labelmates were unceremoniously dropped. “It was in the middle of a pretty major tour, so all of our funding was yanked. Like so many bands, we just went on a downward spiral from there,” Cothran said. 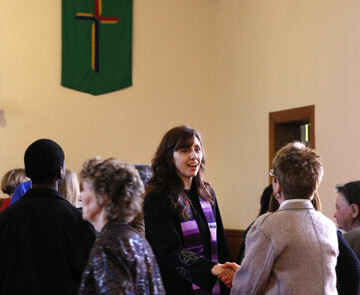 Cothran Woolsey has found her "home" as pastor of West Nashville United Methodist Church. Photo by Kathleen Barry, UMNS. That calling led her to seminary. “I met a United Methodist minister who was out of seminary and waiting to be appointed to a church. I went through a lot of personal changes in my life and rebuilt my life from there after a couple years,” she said. Nowadays, the Rev. Sherry Cothran Woolsey rocks the pulpit as senior pastor at West Nashville United Methodist Church, a small urban congregation across town from the music venues in which The Evinrudes made noise. With the bad taste of the music industry still in her mouth, Cothran Woolsey immersed herself in her studies and put music aside. However, a few musician friends at Vanderbilt encouraged her to get back to songwriting. Combining her musical gifts with an interest in Hebrew texts, she produced thealbum "Sunland." "I'm really intrigued by the stories of women in the Old Testament, particularly ones who are kind of wild," Cothran Woolsey said. "I wanted to look into their stories and all the ways they had been branded: prostitute, witch, disposable daughter. I wanted to unhide some of these women." "Sunland" brings to life the stories of women like Huldah the Prophetess, the Witch of Endor, Rahab of Jericho, and the Wise Woman and Strange Woman of Proverbs. A far cry from The Evinrudes' Southern sass, dreamy violin and percussion evoke "Sunland's" exotic Middle Eastern theme. Loud, crunchy guitars cut through the mysticism, rocking out tracks like "Seen Through" and "The Stars Fought from Heaven." Cothran Woolsey uses her voice - fragile, sleepy, beautiful - to great effect. Frailty embodies the doomed daughter of Jepthah on "In My Lover's Arms," while on "Steady My Prey" a sultry rasp gives voice to Jael, one hand beckoning the equally doomed Sisera, the other behind her back, clutching the hammer. "I was raised on Bible stories, but I didn't always accept the way they were taught to me - I always thought there was more to the story. I love the theological pursuit of digging into lots of different takes on different characters," she said. While researching the material, she found parallels between ancient and modern society, particularly in the different ways women were treated. While Huldah and Deborah were heroes, many others were (and are) seen like the Strange Woman. "If, at some point in your life, you go off the beaten path of what's expected of you, especially as women, then you get labeled: whore, temptress, jezebel. What I see in the song is that God has created all of these things. We have to accept the broken with the whole." During Women's History Month in March, Cothran Woolsey has been blogging about the women of "Sunland." Of her collection of the "wild and untamed," she found a favorite in Deborah. "She's an arbiter, a judge, a poet, a war hero. I love her! She's chosen. She has a beautiful way of expressing herself as very tough but also very compassionate. She's a good model for me. She's like a superhero." A follow-up to "Sunland" is already in the works. 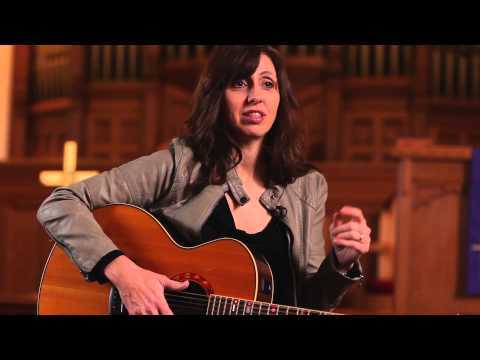 Cothran Woolsey received a grant from the Louisville Institute to write an album based on wisdom literature, so she's turned her sights on Ecclesiastes and Job and Song of Songs. "So many rock songs have been written out of Ecclesiastes anyway," she said. "Life is crazy, and how do I find meaning in this human experience I'm having? Where is God in all this?" After years of keeping her passions separate, Cothran Woolsey is embracing her newfound wholeness. "I'm finally giving myself permission to say, 'This is who I am, this is what I bring to the table,'" she said. "I'm not going to be 'on' all the time as a singer, songwriter or performer; it just doesn't fit in certain circumstances. My job here is the standard role of ordering the church and ordering Sunday morning and visiting people, making sure things are organized. I enjoy doing that. It's also one of my passions." Getting back into music has also helped her mend and reclaim her past. The Evinrudes reunited for a show recently, mixing old favorites with tracks from "Sunland." They even rehearse at Cothran Woolsey's church. "It's really a beautiful thing to be able to come full circle out of all the haziness of broken deals and broken relationships and see that mended," she said. "It's revived so much of my personality and my voice, and reclaiming that space I had lost. Everything's alive again." Editor's Note: This story was first published March, 2013 as part of a series on United Methodist Women Making History. Sherry Cothran will be presenting her lecture and concert, Prophets, Harlots, Witches, and Warriors: Untamed Women of the Old Testament, March 21 in Nashville, Tennessee. *Butler is a Multimedia Editor for United Methodist Communications, Nashville, Tenn.